Viva Las Vegas is an institution. 2017 marks its 20th year, having started as a duct tape and chicken wire music event at a C-list hotel and grown to a well-organized and relaxed gathering of rockabillies, retrophylliacs, tikimaniacs, ancient iron aficionados, and related subtribes at The Orleans in Las Vegas. There are two kinds of people: those who’ve been and those who have VLV on their bucket list. The first group knows the drill. This is for the rest. Music remains the central focus with Wanda Jackson (“Fujiyama Mama”), Brenda Lee (“I’m Sorry”), James Intveld (“Crying Over You”), The Blasters, and Larry Collins (Collins Kids) among the leaders on the bill. The San Francisco Bay Area will be represented by Jinx Jones and the KingTones, Lost Dog Found, Texas Steve and The Tornados and others yet to be added. 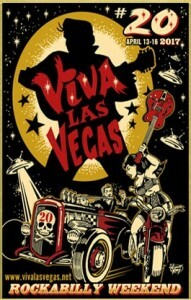 Click below to find bands coming from all over the world to strut it at VLV. 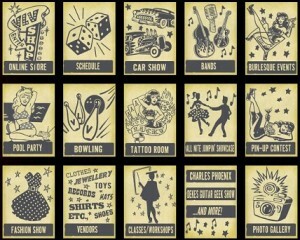 In addition to live music, VLV offers a car show, stage shows, three days of pool partying, burlesque, bowling, workshops and more. Click of the graphic below to find the menu of events on VLV’s home page. A mere $140 buys all four days, wall-to-wall, before March 15th, after which prices rise and the event sells out. Newbies, the 20th anniversary couldn’t be a better time to cross this off your bucket list.